After A.C. Milan (2-0), A.S. Roma (3-1), Napoli (3-2) and Siena (1-0) this time we beat Cagliari (2-1) by goals of Sokratis Papastathopoulos and Thiago Motta. 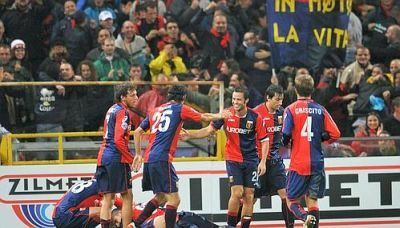 Genoa now is on the 7th (Uefa-cup) position in the standings with 16 points in 9 matches. 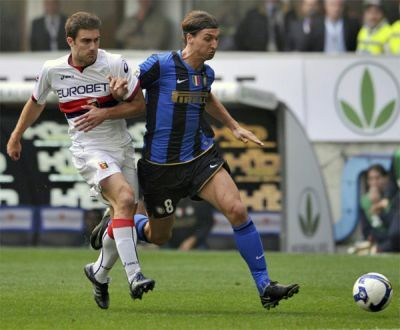 With Andrea Gasbarroni in the line-up as substitute of banned Ivan Juric the Gasperini-boys started agressive. In the 25th minute after a corner Mesto brought the ball again in the penaltyarea and by the 2nd post Sokratis scored his second goal of the season. After 10 minutes in the second half Thiago Motta scored his first Italian goal out of a very difficult position besides the goal. 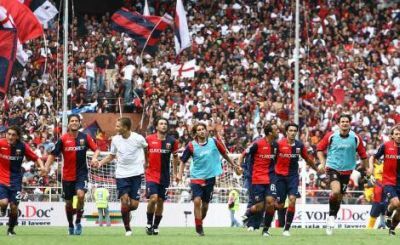 We all hope the match was over now, but Cagliari did not want to give up and went stronger and stronger. In the 66th minute Bianco scored the 2-1 out of a freekick and it was clear that Genoa still was tired of the match with 10 against 11 in Giuseppe Meazza. But luckily we have Diego Milito that passed the ball after a corner of Cagliari besides Fini who kicked him and got his 2nd yellow, so red card. With 11 against 10 we saved the 2-1 score and did win also our 5th homematch. Genoa misses Juric (banned) and Milanetto, Modesto, Olivera, Palladino, Paro (injury). The last 60 homematches Italian Champions and number 1 in the standings Inter always scored at least 1 goal and so far this season Genoa never was unbeaten outside Luigi Ferraris. Statistics say a lot in football, but not everything. Today Genoa played a fantastic match and deserved a draw in Giuseppe Meazza, especially because the last 36 minutes we played with 10 players after the second yellow card of Juric by referee Orsato, who refused to give frustated Zlatan Ibrahimovic at least 4 yellow cards. For the first time Thiago Motta started in the line-up and because both Palladino and Gasbarroni were not ready to play Mr. Gasperini put Marco Rossi together with Milito and Sculli as forward. Genoa played a fantastic first half and deserved a goal in the 36th minute when Mesto hit the crossbar with his 25 meters shot. In the second half of course Inter became stronger and stronger and especially after the red card of Juric in the 60th minute we all feared that Inter would score. Maicon hit the crossbar and Ibrahimovic, Cruz and Balotelli did everything to beat Rubinho, who keeped a perfect match. In the 96th minute Thiago Motta almost scored the winning goal with a great free-kick but this would be too much. The draw already was perfect! Midfielders: 29 Brivio, 28 Juric, 20 Mesto, 8 Roman, 7 Rossi, 88 Thiago Motta, 68 Vanden Borre. Last season Genoa sold 21.675 seasontickets, we all thought because of the return after 12 years in Serie A. The number of single tickets was 3070 every match, so their was an average of 24.745 supporters in Luigi Ferraris every homematch. This summer because of the good results last season (10th place) and the arrival of Milito at the end, the club sold 22.856 seasontickets. 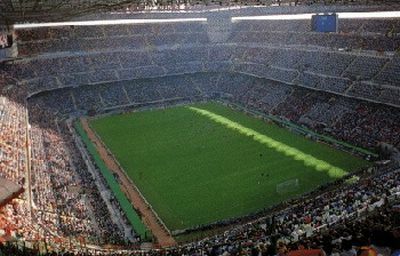 Only 269 less then in the Uefa-cup season 1991-1992 when 23.125 Genoani bought a seasonticket, the all times record. Besides the good news, unfortunately there is also bad news. Our playmaker Omar Milanetto who left the field with an injury after only 15 minutes last Sunday against Siena is not able to play the next 40 days. ‘Hannibal’ hopes to return in the team just before the derby against Sampdoria next 7th December. Also our 4th homematch this season ended in a victory. The first one ever against Siena, because till today we only draw and lost twice against the Toscany team. The goal was scored by Giuseppe Biava who headed a corner in the 20th minute behind goalkeeper Curci. A few minutes before Thiago Motta made his debut by substituting injured Omar Milanetto. In the second half especially Diego Milito had some chances to double the score, but on the other side Rubinho saved a great shot of Galloppa. Genoa is now 9th in the standings with 12 points in 7 matches, next week we play in Giuseppe Meazza against number 1 Inter, that beat A.S. Roma tonight by 0-4 in Stadio Olimpico. In the history Genoa played 4 times at home against Siena and our Rossobluboys never won. The first 2 matches ended in a draw: 1-1 and the last 2 matches Siena did win by 1-3 in Marassi. Time for a change ! With Siena play 5 ex-Genoani: Manuel Coppola (Genoa Club Amsterdam Genoano of the year 2005-2006), Paul Codrea (with Genoa in the years 2001-2003), Daniele Portanova (1998-1999), Abdelkader Ghezzal (bought and sold by Genoa this summer) and one of the biggest talents in the world: Fernando Forestieri who is rent to Siena, but 100% owned by our president Mr. Preziosi. Goalkeepers: 83 Rubinho, 73 Scarpi. Defenders: 25 Biava, 26 Bocchetti, 4 Criscito, 27 D’Alessandro, 13 Ferrari. Midfielders: 29 Brivio, 28 Juric, 20 Mesto, 77 Milanetto, 8 Roman, 88 Thiago Motta. Forward: 18 Gasbarroni, 17 Jankovic, 22 Milito, 10 Palladino, 14 Sculli. Genoa misses: Sokratis + Rossi (both banned after red card against Napoli), Modesto, Olivera, Paro + Potenza (injured) and Anthony Vanden Borre (disciplinary punished). Thursdaymorning early at 2.15 hours the match Chili-Argentina started in Santiago di Chili with Diego Milito in the line-up of Argentina. Because Argentina was 1-0 down coach Basile substituted Diego after 45 minutes, but it did not help him: Argentina lost for the first time in 36 years against Chili and Basile was fired yesterday. After the match Diego flew in 2 hours back with the team to Buenos Aires, from Buenos Aires 13,5 hours together with Inter-players Cambiasso and Zanetti towards Madrid and in 2,5 hours from the Spanish Capital to Genova. Very tired because of the long trip and the time-difference Diego yesterday was present at the Pegli-trainingsfield. Today he has to do a test to see if he is healthy enough to play tomorrow against Siena. The newspapers expect that our topscorer starts on the banch and Raffaele Palladino starts in the line-up. Wednesdaynight Anthony Vanden Borre played a great match against European-champions Spain, that Belgium lost in the 90th minute just after Vanden Borre was changed. On the supporterssites Genoa-supporters talked Thursday about the great match of Anthony and spoke about a possible line-up against Siena. Now the discussion is over because Anthony did not return on time in Genova and Mr. Gasperini probably punish the Belgium international and doesn’t put him in the team against Siena.